Sergio Aguero will miss City's second game in five days after limping out of their 2-0 win at Fulham on Saturday, while Fabian Delph is also not fit to return. There could be a recall for Benjamin Mendy, however, more than two months since his last appearance against Burton in January. Cardiff have no new injury worries for the Premier League trip to champions Manchester City. Warnock had warned after Sunday's controversial 2-1 defeat to Chelsea that he would play his under-23 side at the Etihad Stadium on Wednesday. But Warnock confirmed at his pre-match press conference that he will be taking a full squad to Manchester, apart from Sol Bamba (knee) and Callum Paterson (ankle) who will not play again this season. 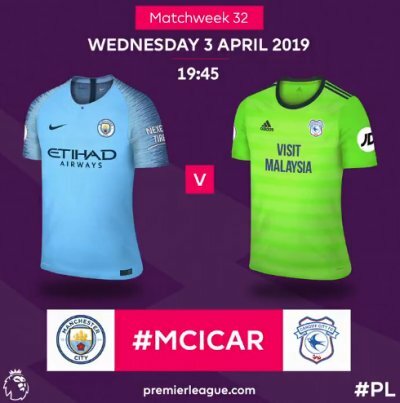 Cardiff haven't kept a league clean sheet against Man City in any of their last 13 meetings (34 goals conceded), since a 0-0 home draw in February 1962. Manchester City have won 16 of their last 17 Premier League home games, losing only against Crystal Palace in that run (2-3 in December). Man City are unbeaten in their last 35 Premier League home games against promoted sides (W31 D4), since a 0-2 loss vs Reading in February 2007. Man City haven't lost a midweek Premier League home game (Tuesday, Wednesday, Thursday) since May 2010 against Tottenham, winning 22 and drawing five since. Cardiff have won two of their last five Premier League away games (L3), as many as they had in their first 28 in the competition (W2 D6 L20). Cardiff have lost all 10 of their Premier League away games against 'big six' opposition, conceding 27 goals in the process. Cardiff's last eight away goals in the Premier League have all been scored in the second half, with half of those being scored in the 90th minute or later. They last netted before halftime away from home in September against Chelsea. In six previous away games against Manchester City in all competitions, Cardiff manager Neil Warnock has never won (D2 L4), with his sides failing to score in all six meetings. Sergio Aguero has scored 18 goals in 17 home games for Man City in all competitions this season, including 11 in eight so far in 2019.